The Georgia Aquarium is the largest aquarium in the Western Hemisphere with tanks holding more than 10 million gallons of fresh and salt water. This living museum, while fun and enjoyable, was ultimately created to inspire awareness among guests and instill in them a desire to preserve our oceans. The massive structure houses more than 100,000 species and 100 distinct habitats. Creatures that call this Atlanta aquarium home include whale sharks, dolphins, sea lions, belugas, manta rays, penguins, seahorses, and more. Since opening its doors in 2005, Georgia Aquarium has become a leader in not-for-profit research, education, and conservation. For sweeping views of the city, take a ride on the SkyView Ferris Wheel, which towers nearly 20 stories above Centennial Park. Guests will experience breathtaking views of the Atlanta skyline and surrounding metropolitan area in one of the 42 climate-controlled gondolas. For an even more exciting experience, take a ride in one of the VIP gondolas which boast Ferrari-style seating, glass floors, and a longer ride. This is an awesome bucket list item for your trip to Atlanta. Voted as one of the best dive bars in America, the world famous Northside Tavern is a cool destination for live music seven nights a week. Sip on cheap drinks and listen to great Atlanta bands perform regional blues, roots, and jazz music in this converted old gas station. Built in the 1940s as a neighborhood grocery store and gas station, Northside evolved into a neighborhood bar that soon became a fixture in the area for lively entertainment and refreshments. In 1886, Atlanta pharmacist Dr. John S. Pemberton create a unique soft drink using a flavored syrup and carbonated water that was sold at his local drugstore. During its first year of production, only about nine glasses of the five-cent soda were sold each day. Today, a whopping 1.9 billion servings are sold around the world daily. World of Coca-Cola celebrates the rich heritage of the soda and the company. Learn about the bottling process, the secret vault with the formula, mix and taste your own recipes, see how the soda has affected pop culture, and meet the iconic polar bear mascot. The historic Fox Theatre is one of Atlanta's grandest venues for live entertainment, hosting more than 150 live shows each year. From Broadway shows to rock concerts, the theater is known for its ornate gilt work and soaring ceiling painted to look like a vast cobalt "sky" with a sea of twinkling stars. If you're not in town for a show, the theater offers 60-minute guided tours by dedicated employees who provide visitors with intimate details of the theater's long history from its origin as a home for the Shriner's organization in 1928 through, and its survival through the Great Depression, from closures and re-openings to a grand renovation and re-opening in the mid-1970s. First opened in 1928, The Varsity is an Atlanta institution and the world's largest drive-in restaurant. Enjoy greasy onion rings and a chili cheese dog while sipping on one of their famous frosted orange shakes. Head inside for a retro vibe and a friendly greeting of "What'll ya have...What'll ya have?" Even with six locations, and growing, The Varsity is a family-owned business that's become a part of Atlanta's legacy. As Georgia's most visited attraction, Stone Mountain Park encompasses 3,200 acres of natural beauty and historic sites. Just 15 miles east of Atlanta, adventure awaits as you indulge in a host of activities that are fun for the whole family. The centerpiece of the park is the mountain itself, as the largest piece of exposed granite in the world. Take the easy one-mile hike to the top and you'll be able to see up to 45 miles on a clear day. Also explore miles of wooded trails that will lead you to places for kayaking, golfing, biking, snow tubing, shopping, and more. The park is open year-round but the events and activities vary by season. Find your inner journalist at the CNN Studio Tours. In 1980, Ted Turner launched the Cable News Network (CNN), the world’s first 24-hour news network, in Atlanta. Today you can visit the channel’s world headquarters for some exclusive, behind-the-scenes access. On a guided 50-minute walking tour of the halls of CNN Center you’ll learn how a live broadcast is produced and viewed by millions of people all over the world. Tours run approximately every 20 minutes, seven days a week between 9 a.m. and 5 p.m. — but reservations are recommended as they are known to sell out during peak hours. Commissioned by the Fulton County Arts Council, 54 Columns is a minimalist public arts project by Sol Lewitt compromised of 54 concrete pillars. Each pillar ranges from 10 to 20 feet in height and are arranged in a triangular layout, representative of the surrounding urban environment and Atlanta skyline. This integration of art and architecture is a great place to wander, take photos, and start conversations about the boundaries for what we consider to be art. As Atlanta’s oldest public park and the final resting place of many of its distinguished residents, Oakland Cemetery is a hidden treasure near downtown. Among the 70,000 buried here are golfer Bobby Jones, and Gone with the Wind author Margaret Mitchell. Built in 1850, the cemetery has some eerie vibes that are fueled by its Civil War history including a Confederate wing where people have claimed to see uniformed soldiers milling about and hanging from trees. Either take a self-guided tour of the grounds or join one led by a knowledgeable guide on Saturdays and Sundays year-round. It’s hard not to notice the colorful storefront of Junkman’s Daughter when driving down Moreland Avenue. Located in Atlanta’s neighborhood of Little Five Points, the Junkman’s Daughter first opened in 1982 when Pam Majors — a real daughter of a real junkman — rented a 1,000 square-foot storefront and filled it with random tchotchkes that her parents had accumulated. Today it has grown 10 times in size and is filled with weird and wonderful goodies that draw in locals, artists, musicians, trendsetters, and celebrities. Here you can find cool accessories, retro toys, unique gifts, a large collection of wigs, and even a staircase in the shape of a giant shoe. 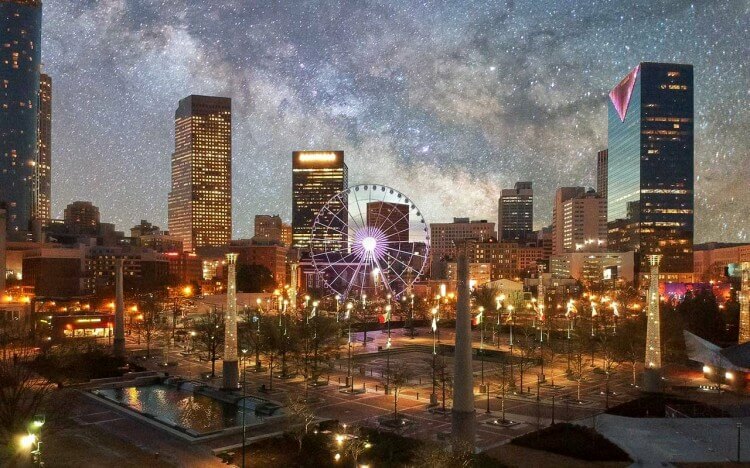 Centennial Olympic Park is a 21-acre public park that was created as a spot for visitors and residents to enjoy the 1996 Summer Olympics. Today it stands as a legacy to the Olympic Games and serves as an epicenter of a thriving tourist district. Enjoy weekly live music, leisurely strolls, or splashing in the Fountain of Rings — the world’s largest interactive fountain to incorporate the Olympic Rings symbol. The Fountain also puts on a water show four times a day, 365 days a year, at 12:30 p.m., 3:30 p.m., 6:30 p.m., and 9 p.m.
A short underpass that connects the historic Atlanta neighborhoods of Cabbagetown and Inman Park is a street artists’ haven. Not an inch of Krog Street Tunnel is left unpainted, whether the art be small tags or huge intricate murals — and it’s constantly changing as new artists make their marks. Artists started painting the tunnel with graffiti as far back as 1967, and it is filled with political, inspirational, and philosophical marks that change frequently. People also use it as a message board for local events and festivals, and even marriage proposals! It’s pedestrian friendly so take your time wandering through and admiring the art. The Atlanta Botanical Garden, in the heart of Midtown, is an urban oasis where nature lovers and fun-seeking families can come together and take in the beauty of it 30 acres of outdoor gardens. The area features an award-winning Children’s Garden, beautiful art sculptures, small cafés, a unique Canopy Walk, and the beautiful Skyline Garden. The Atlanta Botanical Garden was created to display a variety of plants for people to enjoy as well as to educate, research, and conserve for future generations. Housing more than 15,000 pieces of permanent art, the High Museum of Art is one of the nation’s leading art museums in the Southeast. The High Museum features American art, European art, African art, decorative art, folk art, photograph and more contemporary works, plus an exciting schedule of special exhibitions. There are also fun exhibits for kids including a learning gallery with hands on activities and multi-sensory elements. As one of Atlanta’s most iconic visible features, the BeltLine is transforming unused train tracks into 33 miles of walking and biking paths. It’s an ongoing project that is said to be completed in 2030 and will loop around the entire city — but in the meantime, there’s still plenty to do! Bike the path and enjoy the outdoors, go on a pub crawl at the many bars, shop around at Ponce City Market, and enjoy public art work including murals and sculptures. Located in the Centennial Park District, Der Biergarten is an indoor/outdoor German beer garden offering an authentic experience. The menu has traditional German food such as Riesenbretzel (a warm pretzel with various mustards), Wurstplatte (a variety of wursts) and Goulasch Suppe (a hearty beef stew). Its beers are of the German variety and range from light to dark, so there is something for everyone. The place also has table shuffleboard, an alley with “Fussball,” and lots of TV’s for watching American and European football. The 135-acre Cascade Springs Nature Preserve in southwest Atlanta is a great spot for a peaceful day hike. The spring waters, though they once ran red with blood from a Civil War battle, are now said to have healing powers and at one point were bottled and sold. Take in the iconic moss-covered spring house, and in warm weather, splash around in the waterfalls. This is an easy hike and is great for people of all ages. In 2010, three brothers bought a used ice cream cart and started selling popsicles with a purpose to “create Unexpected Moments of Happiness,” and thus King of Pops was born. But these aren’t your average popsicles. Indulge in flavors inspired by the South like chocolate sea salt, banana puddin’, and blackberry ginger lemon. All of their ingredients are locally sourced, and the brothers even started up their own farm to grow ingredients themselves. While they’ve opened up more locations outside of Atlanta, the brothers intend to stick to the South so that they can have a greater impact on where they call home.